Dance Commentary by Heather Desaulniers: "Graham Lustig's The Nutcracker"
Sunday afternoon at the grand Paramount Theatre proved yet again that there is so much to love about Oakland. 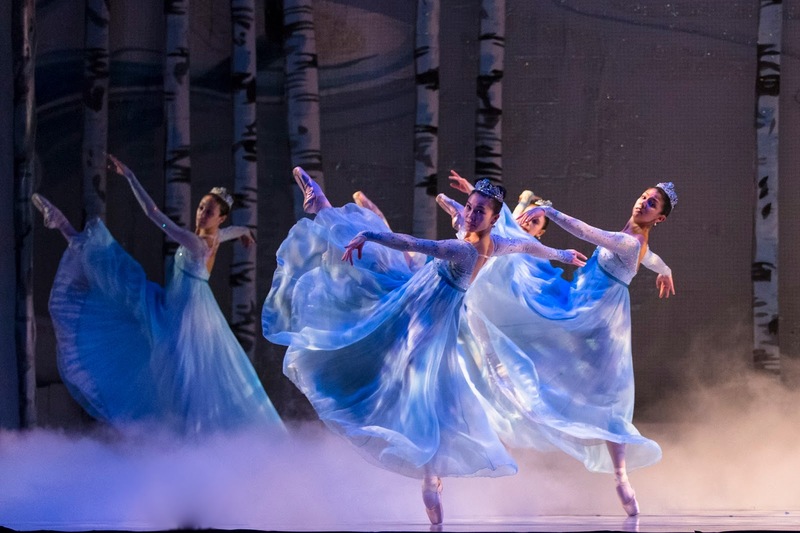 Before a sold-out house, Oakland Ballet closed 2015 with a delightful production of The Nutcracker, choreographed by Artistic Director Graham Lustig and accompanied live by the Oakland Symphony, under the direction of Michael Morgan. This version of the classic Christmas story is a must-see for East Bay dance patrons – intriguing choreography, talented artists and attention to narrative intricacies. At the same time, there is something more steeped in this and every Oakland Ballet performance. History. Lineage. Here is a thriving professional ballet institution that has been part of a city’s artistic landscape for more than fifty years – being in the midst of that legacy is certainly a special and unique experience. One of the joys of Nutcracker season is when you see a version for the first time. A new-to-you Nutcracker injects a level of novelty and innovation into the traditional holiday ballet – new design, new choreography, new vision. And this was the first time I had seen Oakland Ballet’s current adaptation. In Graham Lustig’s The Nutcracker, the story is told through the eyes of Marie, danced by Ramona Kelley. The tale begins in typical Nutcracker fashion at her family’s home during a festive Christmas Eve party. But as this first scene unfolds, it becomes clear that this Nutcracker is anything but typical. It is memorable. The party is full of lovely choreographic sequences, making it much more dance-y than other productions: Marie and her friends’ series of piqués, pointework and partnering for the parent couples, arabesque allongée for Cousin Vera and her beau (Megan Terry and Nathan Cottam). There is a lot of action onstage, but it never once looked crowded, nor did the dancers ever have to truncate their movements. And the acting was superb. When Marie received and first danced with her Nutcracker doll, Kelley was a picture of pure joy while still maintaining her sparkling footwork. As Act I continued, Lustig added some distinct marks of continuity. When the Nutcracker evolves from a tiny wooden doll into a full-size being, Lustig choreographed a pas de deux for him to dance with Drosselmeyer. While it was certainly an interesting choreographic moment, it also made so much sense as a plot point. These two characters are connected and linked; they should have a pas de deux together. Though I must say that I was worried throughout that duet and the ensuing battle scene that the head of the Nutcracker’s costume was going to come off prematurely, and that the mice were going to trip on their long tails. After the battle is won, the Nutcracker does take off his mask and becomes a real-life Prince (danced by Gregory DeSantis). The first interactions between he and Marie were enchanting – shyness built into the parallel bourées; elation in the high lifts and spinning fish dive. Marie and the Nutcracker Prince went on to lead the winter forest scene, which glistened with snowmaidens and fluffy snowballs (and was vocally accompanied by the Mt. Eden High School Women’s Ensemble). Having the main characters reign over and travel through the snow forest was yet another example of Lustig’s attention to continuity. In so many other versions, the couple is absent from the scene or just watching the action on the sidelines. This is their journey and as such, their active participation is a spot-on narrative choice. The snowmaidens skillfully handled the intricate choreography, though the arms did get a little wild from time to time. Lustig’s Act II was every bit the ‘Land of the Sweets’ with peppermint candies, gumdrops and bakers greeting Marie and the Nutcracker. And the collection of divertissements that make up the majority of the act brought skill and energy. While some tricky choreographic transitions and lifts proved difficult on Sunday afternoon, there were many standout performances. The Russian variation (led by Emily Kerr and Seyong Kim) was a noteworthy and winning social dance. And instead of what is often a French sequence, Lustig substituted a German variation. This Baroque-style pas de trois was absolutely charming and danced brilliantly by Chloe Slade, Colleen Soltys and Jahmal Chase. Terry, as the Sugar Plum Fairy, and Cottam, as the Cavalier, sailed through the grand pas de deux with grace and aplomb. Lustig’s combination of lifts, supports and balances coupled with their wonderful partnering kept this part of the ballet (which can lag) moving forward with intensity and spirit.